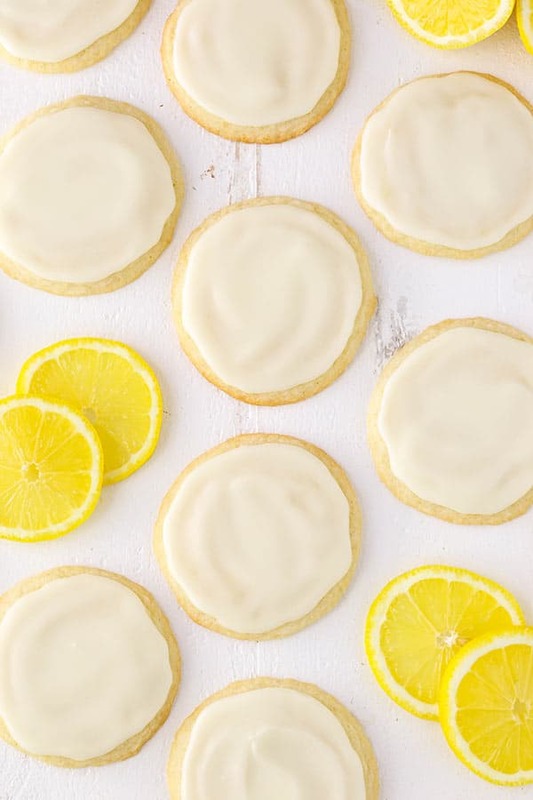 These Limoncello Cookies are soft, with chewy centers and crisp edges. 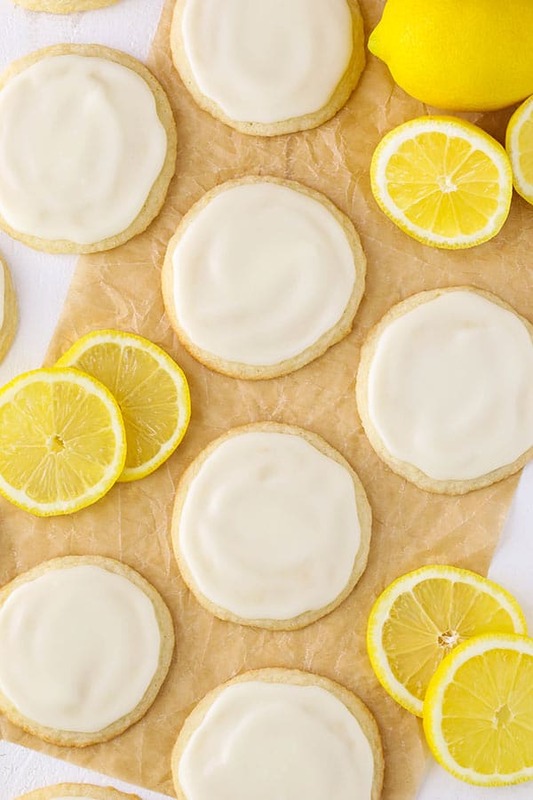 Full of lemon flavor and delicious! 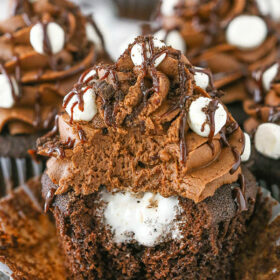 The icing on top makes them perfect! I have been so excited to share these cookies with you! They are from the new cookbook, Cookie Remix, by Megan Porta of the blog Pip and Ebby. Megan has some great recipes on her site (we make this crockpot meal all the time), so I was excited to check out her cookbook and it did not disappoint! The cookbook is full of unique spins on cookies. Everything from drinks to donuts are turned into fun twists on cookies. That’s my kind of baking! Some others I can wait to try are the Salted Caramel Latte Cookies, Cannoli Cookies and Blueberry Pie Cookies. Yum! So when I set out to decide which cookies to bake first and share with you, it was quite tough. So many fun choices! To help make the decision, I passed the book over to my mom. I had a couple in mind and I wasn’t surprised at all when she not only picked one of my picks, but one with limoncello. We love a good cocktail!! So naturally neither of us could wait for me to make them and they were just as delicious as we’d hoped! The cookies are pretty straightforward to make to! Some butter, sugar, and and egg are combined with the lemon components – both lemon zest and limoncello. Add to that some flour, baking power and salt and you’re ready to go forth and bake! For the icing, I actually changed it up a bit. I’ve included both the recipe from the book and mine below. Feel free to use either. The one from the book is quick and straight forward to make. Just fresh lemon juice and powdered sugar. The icing I used is one I put on cookies and bundt cakes regularly. It’s cooked over the stove to thicken it and it makes a nice icing that dries to be fairly firm. I love it. This version uses the limoncello for flavor. The final cookie is so yummy! The lemon flavor is definitely there, but not overpowering and they just melt right in your mouth. I mentioned when I shared these coconut cookies a few weeks ago that my mom was hoarding them, and she definitely hoarded these too. So worth it! 1. Preheat oven to 350°F (180°C and line baking sheets with parchment paper or a silicone baking mat. 2. Using a stand mixer fitted with the paddle attachment, combine the butter, sugars, egg, lemon zest and limoncello and beat on medium speed until creamy and free of lumps. 3. In another bowl, combine the flour, baking powder and salt. Mix well. 4. Gradually add the flour mixture to the butter mixture and beat on medium speed until just combined. 5. Scoop 1 1/2 tablespoon sized balls of dough onto the cookie sheets, 2 inches apart. 6. Bake for 9-11 minutes, or golden brown around the edges with no uncooked centers. 7. Remove cookies from the oven and transfer to a wire rack to cool. 8. To make the icing, combine all the icing ingredients except for the powdered sugar in a small sauce pan. 11. Whisk in the powdered sugar and allow to cool and thicken, roughly 10-15 minutes. 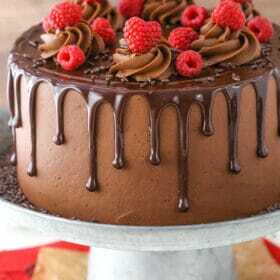 If you find your icing to be a little thick, just add a touch more water to thin it back out. If it’s too thin, add a little more powdered sugar. 12. Spread the icing onto the cookies and then allow to cool. The icing will thicken as it cools. 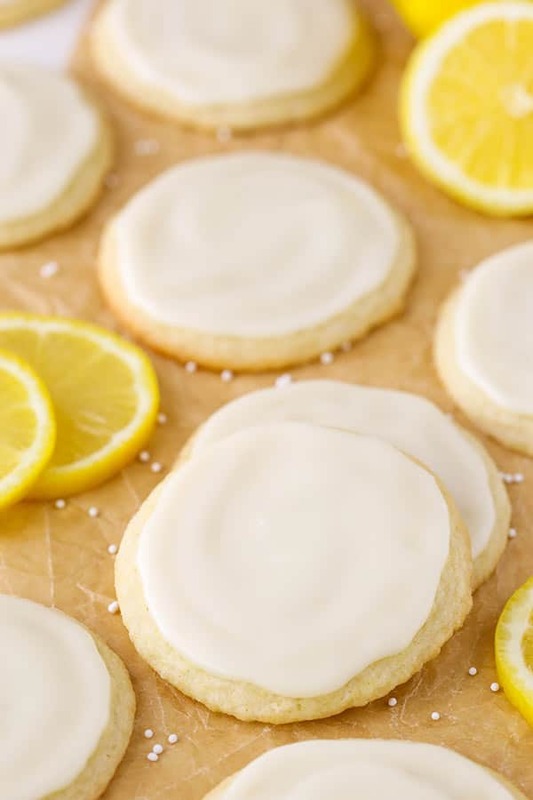 Using a stand mixer fitted with the whisk attachment, combine the powdered sugar and lemon juice and beat on medium speed until free of lumps. Hi Lindsay. Your baked goods are works of art. Beautiful. I’ve never had Limoncello and I wonder how it tastes different than lemon juice. Also, are the cookies ok for anyone, like children, since they have a liquor in them? Thanks for sharing all your beautiful baked goods with us. Thanks so much, Diane! I would say limoncello is sweeter and a little less tart. As for kids, that’s probably a personal call. Is there any way this recipe can be converted to a diabetic (sugar free) cookie? Possibly, I’m just not really familiar with making those substitutions. I’m sorry! I’m always looking for that extra lemon flavor, but unfortunately, in this case, is there a substitute for the limoncello liqueur? I’m sure it adds that extra lemon flavor, but I prefer not using alcohol. Can you substitute lemonade for the lemoncello? I haven’t tried it, but you certainly could. I’m not sure if the sugar content or citrus would make a difference in the way it bakes. I’m thinking it might. What about using lemon extract. I have a lemon pound cake recipe that uses it. I don’t know what the quantity would be for this recipe. Maybe a teaspoon or a tablespoon? I would try a teaspoon of the extract. 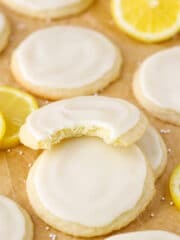 You could try swapping it out with milk or water in the cookie, and use additional heavy cream in the icing. 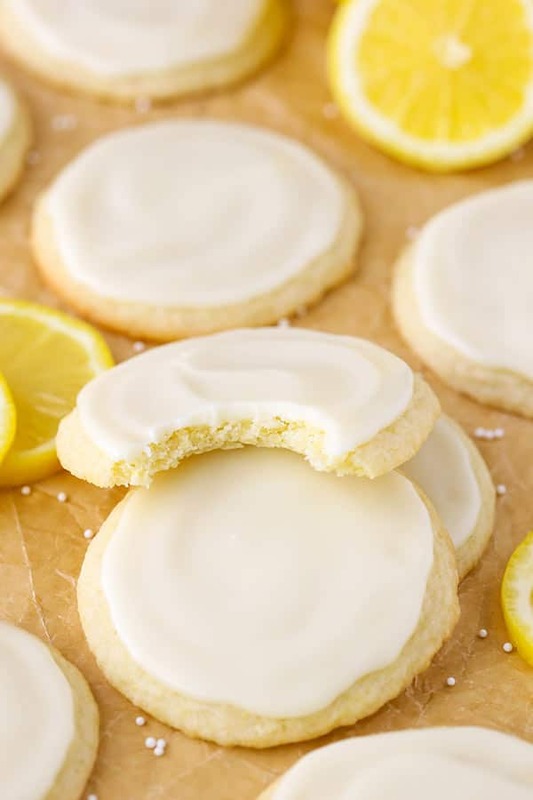 You could potentially add some lemon extract to the cookie, if you wanted. Oh my, these sounds DELICIOUS! Plus, i LOVE LEMON! I need to make these cookies, pronto!!! Great recipe to use my homemade limoncello! Thank you! Definitely! I hope you enjoy them! Would you share your limoncello recipe? Does in REQUIRE liquor? These sound absolutely delicious, can’t wait to try them. I just finished making these and I am sitting here munching on them. 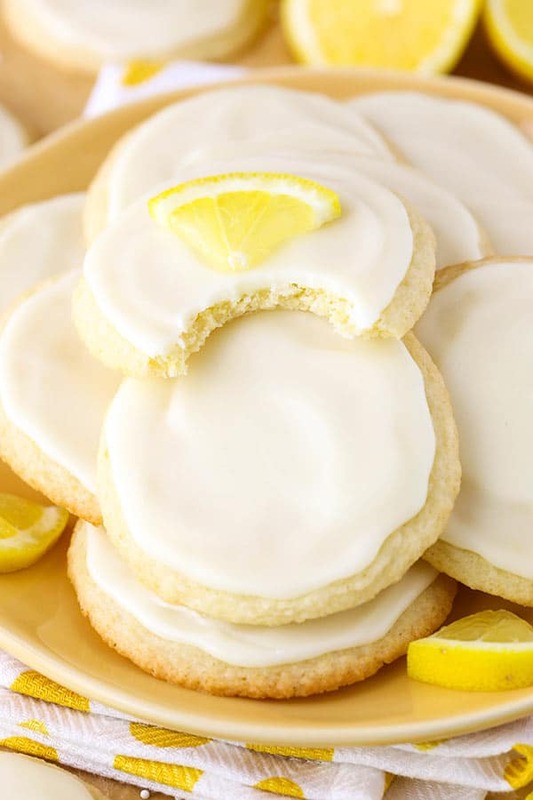 They are absolutely delicious – very strong lemon flavor and very addicting. I make my own limoncello so there is always a bottle in my freezer. Forget the diet tonight. I would like to add – Perfect with a cup of tea or even better, a small glass of Limoncello. How do you make limoncello? I guess it always uses liquor or is there a substitute? Limoncello is an Italian liqueur. There is no substitute for the alcohol. What is the best way to store and how long can cookies be stored before eating. Looking to make them for a soecial event. Store the cookies in an air tight container at room temperature. They should be best for 3-4 days, but might make it a littler longer if needed. I want to comment here for the benefit of anyone who decides to actually make the cookies – I often get the best tips from the comments when I find recipes on-line, so these are things I wish I’d known this afternoon before I started. First, and most importantly: these cookies are delicious! If it were possible for anything to be better than chocolate (and for me, there isn’t) it could be this cookie. 1.) this is a beautiful, smooth, fluffy batter; but it will not spread. My first tray resulted in cookies that were little hillocks instead of the flat round cookie I was looking for. So flatten your batter on the cookie sheet! I used the 1-1/2 tbsp suggested (I got 29 cookies instead of 30) but next time I may make them a little smaller-these were about 3″ across when flattened which I think is an average cookie size, but they are rich and powerfully flavored. 2.) the necessary cooking time was longer to get the first bit of browning on the edges. Maybe my oven? I don’t know but 11 minutes was the minimum. I love those crisp edges; and the inside melts in your mouth like butter. 3.) I made the cooked icing, and I like it a lot. But here’s something to think about: when your finished you have a big rindless lemon left over. 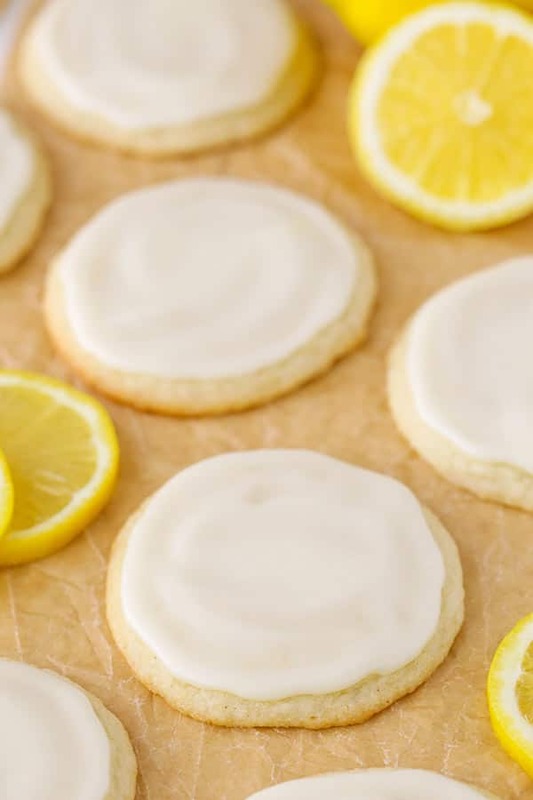 Next time I believe I will use the juice of the lemon in the cookies, adding a bit of limoncello if needed for quantity, and limoncello in the icing only. 4.) finally, it was about twice as much icing as I needed, and this stuff is (as I already said) delicious! It hurt to throw it out! When I make them again I will double the cookie recipe so that I can use up all the icing. So, that’s everything I learned along the way. My advice is make this cookie, it is showy and a real winner!